A popular watering hole in Paia is Flatbread. It's located where the Sandbar used to be. Before that, I think Jacques restaurant was located there, before it moved next to Charley's, where it was a hot spot until the economic downturn. Flatbread's opening lured away a lot of the hip (but not hippie) Jacques crowd. Flatbread is still wildly popular. Everyone likes pizza, and Flatbread also offers gluten free versions. All of the flatbreads are great, except the pepperoni is an acquired taste - it doesn't have a casing, is organic or free-range, but doesn't taste like pepperoni. Crowds of people regularly mingle at Flatbread and spill out of the doors onto the sidewalk. One big plus is that Flatbread sponsors different nonprofits on Tuesday nights, setting aside $1 or $2 per small or large flatbread sold during dinner time. Nonprofits have to provide a canvas banner to publicize the event. 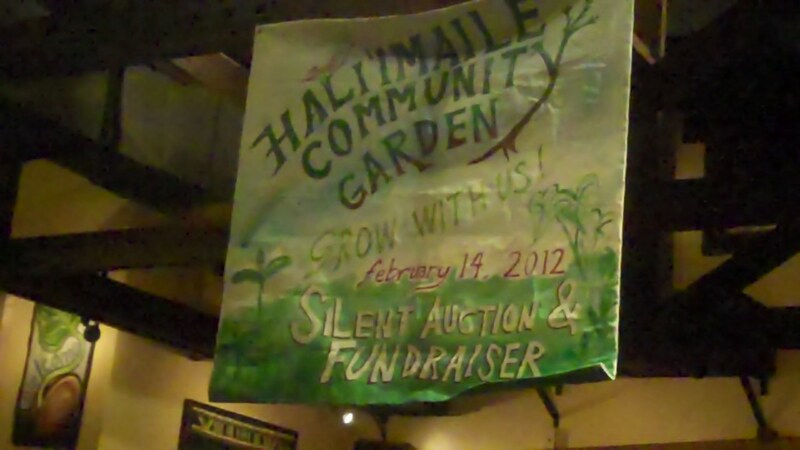 Other nonprofit banners at Flatbread. Banners from previous fundraisers have been affixed to the ceiling of the secondary dining area. Other wholesome banners and artwork decorate the interior of Flatbread.